Dental Insurance Fine Print: What It Means? In this day and age there is a high necessity in having proper dental insurance coverage. However, knowing which coverage plan to select is a heavy responsibility, and not always a simple one to make. Considering the vast number of dental insurance companies available, there are seemingly endless good deals to partake in. It is prudent to know the fine print of any offer before accepting it. If an individual is not aware of every aspect of their deal before agreeing to it, they are subjecting themselves to being taken advantage of by the company in the future. The only way to avoid victimization is to stay educated and make sure the company covers everything they are looking for without hidden fees or obligations. Dental insurance coverage plans have a good reputation for their simplicity. The details behind each coverage are mapped out plainly and in a manner that is straightforward. This allows the process of finding the perfect dental insurance plan for every individual to go effortlessly. The high rate of satisfaction received from their clients allow the insurance business to grow and in turn makes their reputation even higher. One of the most important factors to keep in mind while picking an insurance policy is knowing which dentist to have treatment from and if that dentistry is covered under the insurance. It is quite common for insurance companies to list only certain dentists in which are covered through their policy. If a dentist does not appear on that list, the individual would not be covered by the insurance if they were to attend that facility, and would therefore be expected to pay for their services in full. It is important to know the details behind the coverage received through the insurance plan in order to either avoid having to pay extra fees or changing to a different dentist. The final fine print that usually affects people is the method of payment under the insurance policy. Most individuals assume the dentist bills are shipped straight to the insurance company and paid directly. However, this is usually not the case. Most people are usually sent the bill first and then have to get their bill claimed from the insurance company. This process takes precious time and can end up costing an individual money either if their claim is not accepted or if they have other expenses they need to deal with before their claim is processed. In summary, it is very important for a person to find a coverage plan that they can both fully understand, and agree with the conditions laid out for them. Dental | admin June 25, 2010 | Comments Off on Dental Insurance Fine Print: What It Means? This may seem like a no-brainer, but the best way to maintain good oral and dental health is to visit your dentist regularly. Children and adults should make appointments for regular dental checkups about every six months. Seeing your dentist regularly can help prevent many oral diseases including cavities and gingivitis. If you are feeling any abnormal gum or dental pain than it is a good idea to increase the frequency of your visits. Periodontal disease is a serious gum disease that can lead to other health problems such as heart disease. It is important to maintain your regular visits to the dentist in order to prevent serious diseases from arising. If you’re suffering from periodontal disease, gingivitis, or tooth decay, these regular visits can help detect these diseases early on and help you get treatment faster. You may be surprised to know that the leading dental problem in adults and children is bad breath. Your regular dental checkups can help avoid or eliminate this unpleasant problem. There is another perk for visiting your dentist regularly. 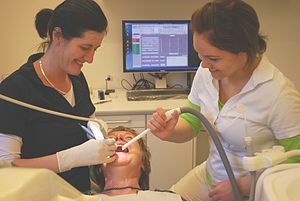 Knowing the ins and outs of current dental care is a great way to be on top of your dental health. If you’re interested in cosmetic dental surgery, for instance, visiting your dentist every six months will help you stay informed with the current options available to you as well as health risks and varying prices. Remember that cosmetic dental procedures are not only costly, but can cause serious health problems if you do not take the time to assess the risks. Stay up-to-date with your dental visits and talk to your dentist to see if cosmetic dentistry is right for you. Even if you have never been to the dentist before, call your local dental professional now and take charge of your dental health. You could have a serious dental problem and not even realize it. By calling your dentist now, you can help prevent serious oral diseases such as tooth decay, gingivitis, bad breath, oral cancer, and periodontal disease. If it has been longer than six months since your last dental checkup, consider making an appointment today. This is the first step in helping to keep your mouth and body healthy and safe. Stay on top of your dental health now and your mouth will surely thank you for it.